The Gorkhaland Territorial Administration (GTA) has decided to beautify the Victoria Falls and its surroundings by building a steel bridge alongside the existing one that connects several remote villages of Darjeeling sub-division. The 110-feet long Victoria Falls Bridge was built by the British way back in 1912 and has long outlived its age and weathered both natural and man-made calamities. “The existing bridge is very old and the risk of accidents is high as heavy vehicles pass through it regularly. If a steel bridge is constructed parallel to it, the old bridge will continue standing and we need not worry about accidents taking place,” said Sonam Bhutia, executive director of the GTA tourism department. He added vehicles will be permitted to use the new bridge only when it is fully completed. Meanwhile, the old bridge will be strictly for pedestrians after conducting necessary repairs and renovation. 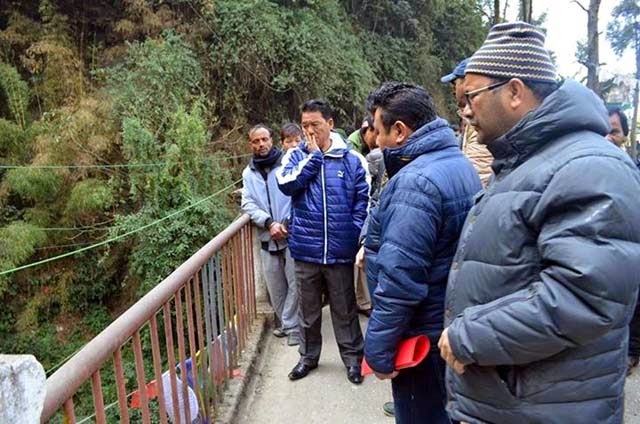 GTA chief executive Bimal Gurung inspected the Victoria Falls area On Friday morning along with executive engineers of the council and Darjeeling municipality officials. Set right in front of a natural waterfall, the Victoria Falls Bridge was a popular tourist destination till the mid-80s and the neighbourhood has also come to be known by that name. Pony-mounted tourists would come to the area from Chowrastha to take pictures of the beautiful waterfall and the breathtaking Kanchenjunga range in the backdrop. But the waterfall has dried up over the years and the spot has turned into a garbage dump site. Concrete buildings have mushroomed in the area blocking the view of the mountain range, prompting travel agents to drop Victoria Falls from their tour itinerary. The GTA is hopeful of restoring the lost glory of the place after the construction of a new bridge and beautification work. “The approach road to the area is very narrow, but this disadvantage can be offset by rejuvenating the place. Both tourists and locals will be able to enjoy the beauty of the place from the old bridge without needing to keep an eye out for approaching vehicles,” said Bhutia. At the outset, the GTA will conduct a survey of the area following which a detailed project report will be prepared. It will then float public tenders for the construction work.